An attractive, manually operated counter-mounted dispensing system that delivers the perfect amount of soap – every time! Washroom visitors will appreciate our luxurious soaps and reliable, hygienic dispensing. Premium soap formulas that produce thick, rich lather delivered touch-free for a luxurious hand washing experience. OneShot offers a wide choice of formulations, hypoallergenic, for sensitive skin, and antimicrobial soaps. All soaps contain moisturizers such as Aloe and Vitamin E to soothe the skin. 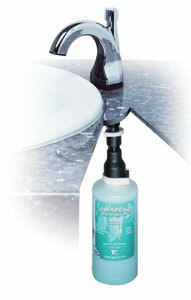 Disposable refills with TC’s Hygienic Seal™ keeps soap fresh and clean providing a more sanitary system. A recent study revealed that 25% of reservoir or bulk soap systems were contaminated with potentially harmful bacteria. Convenient, reliable delivery of fresh clean soap ensures customer-delight. More hand washes with fewer refills reduce labor and costs. 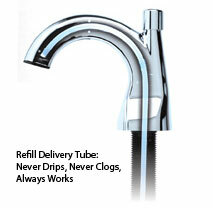 New pump and delivery tube with every refill eliminates mess, clogs and drips – guaranteed to work every time. No downtime, costly repairs and cleaning, or replacement parts. Simple 2 minute installation and "one-handed" refill loading further reduces costs.